Another Hurricane Wrenches Up Fishing, Marlin and Sailfish Pick up the Slack! If you are anything like me, after being in several ¨Rodeos¨ you become indifferent to things like Hurricanes, especially when they´re so far out there they can´t affect you. But this is not exactly true since you for the most part still get the rain, sea conditions, humidity and how it affects the fish. That´s right amigos Hurricanes affect fish in all sorts of ways. They feel pressure from the storms and they have been doing this for millions of years so they stay out of hurricanes way. What that meant to us this past week in a word is Ilena. Hurricane Ilena and while it was six hundred miles or more out to sea, we all felt the effects of it here in Puerto Vallarta. Weather wise and fishing wise it was a rough week but there are signs again things are coming back to normal. Welcome to fishing in Mexico, if you´re not flexible, you´ll break! I guess you figured out by now we had Hurricane Ilena form about six hundred miles or so directly west, a second one now in a months’ time. So like last time, the pressure and storm itself pushed fish anywhere but here in Vallarta. What was flourishing fishing grounds became a Yellowfin Tuna Ghost Town. 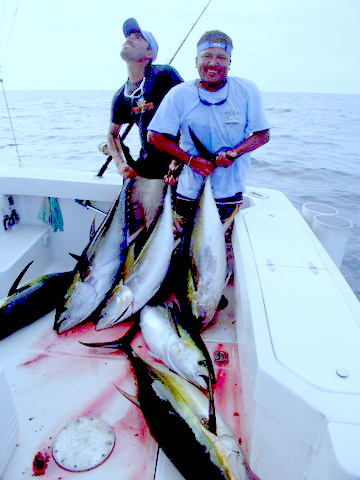 If you are looking for Yellowfin Tuna of any size, half size would be more appropriate, then Yelapa is the place to be. Now you may say this goes against conventional thinking, but seeing is believing amigo. There are some deep holes around Yelapa at the south end of the bay. Yellowfin tuna for about three weeks now have been hanging there and in the bay. 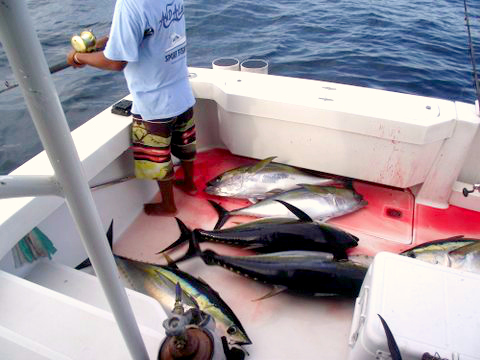 So if you are looking for Yellowfin Tuna action, Yelapa has what you´re looking for. The YF Tuna have been running from a heavy 35 lbs to just under 70 lbs. They´re taking bait on the surface, the smaller ones that is. But the bigger ones are deep so you´ll be jigging if you want a sizeable YF. While there, why not swing Boca and see what´s happening at the river mouth, Snook are running 25 to 40 lbs if they see your bait. You want to be where the fresh water hits the salt water, not upstream at all, Shinny baits are a good thing. The Trash line is still in force, that´s a break from the heavens. Normally we see lots of Dorado hitting the TL hard, but we´re seeing Bonito for the most part. And by the way, there is a Boat Load of Bonito and Skip Jacks in the bay. Dorado is scary late this year for bay Dorado that is… That´s pretty much the bay for you this week. El Morro remains strong on Sailfish, for some reason they´re not ¨diggin¨ the Marietta islands this year. El Morro has upwelling’s there that attract bait fish..Etc. Sails have been decent sized as well. Me, if I was here on vacation, I would take Guanatuna II our super panga for eight hours, get about half way to the Rock (Corbeteña) for distance, maybe hit a Blue or Black Marlin as well. Please, please release your Billfish. El Banco at this time of the year will spring to life and it has. There are Dorado at El Banco 35 to 55 lbs. Sailfish are everywhere to about 90 lbs, not bad sized for a Sailfish. Cubera Snappers or Dog Tooth Pargo running to 60 lbs right now will fill the freezer amigo. Fun to catch and fights like a Sailfish, great light tackle species. Black Marlin to 400 lbs with Blue Marlin in the same range. But they´ll be work, you´ll need all your skill and equipment to make the day a success. Marlin are normally larger than what we´re seeing now so there is a good chance sizes will increase in the coming days. Corbeteña, same as El Banco, but not quite. Sailfish, Marlin, More Cubera Snappers, Dorado, Smaller Yellowfin Tuna in the next few days. Same as El Banco, except Corbeteña is closer and for my buck a better fishing ground for the last few years. Blue water and plenty of bait fish insure great days ahead. There are a lot of Amber Jacks out at the rock right now. Any day now the Yellowfin Tuna will be bouncing off 200 lbs consistently. The water conditions are about as good as they can get and the fish are out there. The only thing missing is you.